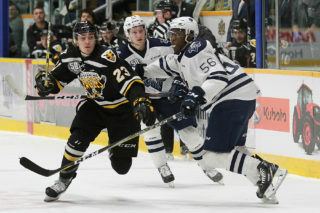 The Cape Breton Screaming Eagles drafted 13 new players to the organization and completed three significant trades to reshape the club’s roster at Saturday’s QMJHL draft in Shawinigan. Additionally the club chose two players in the QMJHL’s new draft for American players on Monday afternoon. A pair of forwards from the Nova Scotian major midget league were the first two selections for the Screaming Eagles on Saturday. With the tenth pick in the opening round Cape Breton took Alex Drover from the Halifax McDonald’s. The 5’9, 165 pound forward notched 57 points in 36 games last season. He was also named the top rookie in the Nova Scotia Major Midget league. After making a trade with Bathurst, Cape Breton moved up to pick #36 in the second round and took Dartmouth Steele Subaru forward Ben Allison. (The Eagles dealt a second round choice in 2019 to acquire the pick.) Allison notched 28 points in 36 games last season and was more than a point a game player in the playoffs as Steele Subaru were league champions. The 5’11 158 pound winger is the son of former Cape Breton Oiler Scott Allison. Alex Falardeau from Lévis in the Québec midget AAA league was the first defenseman tabbed in the draft by the Eagles. 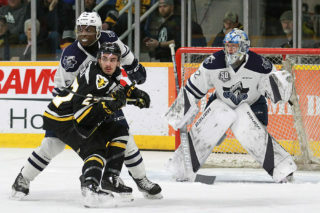 With pick #72 in round four, Cape Breton chose the 5’10, 158 pound blueilner who was one of only five players to appear in all 40 games for Lévis last season. Staying in the province of Québec, Cape Breton nabbed a pair of forwards from the top midget league with the next two picks. At pick #79 in round five the Eagles tabbed 5’10, 158 pound Karl Vaillancourt who recorded eight points in 40 games with Magog. In the sixth round with pick #95, 5’11 164 pound Noah Gaudette of Saint-Eustache was taken after posting 19 points in 36 games last season. It was back to the Maritimes for the next five picks the Eagles would make. In round seven (pick 115) Cape Breton called the name of 5’11, 177 pound defenseman Logan Carruthers, who recorded 12 points in 34 games with the McDonald’s while making the Nova Scotia major midget all-rookie team. Round eight saw the Screaming Eagles choose the first of two goaltenders on the day. 5’11, 145 pound Jacob LeBlanc, picked in round eight at 141st, posted a goals against average of 3.24 through nine games with Rothesay Netherwood School prep school in New Brunswick. 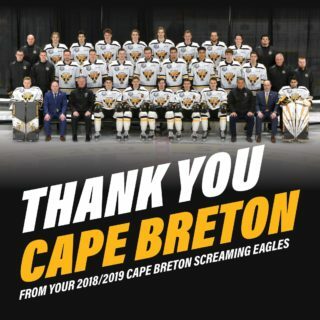 A pair of players from Cole Harbour in the Nova Scotia major midget league were the next two choices for the Screaming Eagles. 5’5 146 pound Brady Hunter was chosen in round nine (#151) following a season in which he posted 30 points in 36 games. At pick #169 in round ten, the Eagles welcomed defenseman 5’7 140 pound Matthew Power who collected eight points through 36 contests last season. in the eleventh round at pick #187, Cape Breton tabbed Marc Richard, a 5’11 149 pound player who produced 29 points in 35 games with Kensington in the New Brunswick/PEI midget AAA league. Following the Richard choice the Screaming Eagles would choose a player at each of the three positions to conclude the draft. With pick #205 in round 12, the final blueliner chosen was 5’11 160 pound Simon Singher, who recorded 17 points in 32 games with CCL Dynamiques in Québec midget espoir. 5’7 133 pound Mason Beck of South Shore in the Nova Scotia major midget league was the final forward selected (round 13, #223) following a 23 point season (over 36 games). And with the team’s final choice (round 14, #241), the Screaming Eagles selected Cape Breton Tradesmen goaltender Josh Leudy- a 5’11 145 pound netminder who had a save percentage of .850 in 15 games in the Nova Scotia major midget league. In the American draft on Monday afternoon Cape Breton chose Richard Hart in round one (#7) and Robert Lapsley in round two (#25). The 6′ 157 pound Hart is a defenseman recorded ten points in 18 games with the Under 16 New Jersey Colonials last season. Lapsley, the lone 2001 draftee by the Screaming Eagles, is a 6’3 195 winger who collected six assists last season with Noble and Greenough. On Saturday the Screaming Eagles made a pair of trades involving roster players. Cape Breton acquired 19 year old defenseman Antoine Crête-Belzile (1999-08-19) from the Blainville-Boisbriand Armada in exchange for 19 year old forward Peyton Hoyt (1999-02-18), 17 year old forward Antoine Rochon (2001-02-25) and the 22nd pick in the 2018 draft. 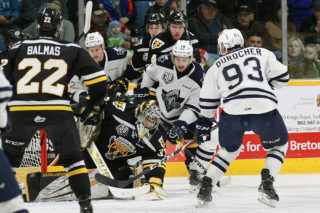 The Eagles also acquired a fourth round draft choice in 2019 from Blainville-Boisbriand in the trade. Last season Crête-Belzile produced ten points over 51 games with a +24 rating in his third season with Blainville-Boisbriand. The veteran 6′ 188 pound defenseman was originally chosen with the 11th overall pick in the 2015 QMJHL draft by Blainville-Boisbriand and attended Winnipeg Jets training camp last year. Hoyt collected 24 points through 52 games last year for Cape Breton in his third year in the QMJHL. Rochon produced 37 points in 40 games with Saint-Eustache in the Québec midget AAA league. Another draft day swap saw the Screaming Eagles send Kyle Jessiman (1999-01-12) to Baie-Comeau in exchange for a second round pick in 2019. Last season Jessiman posted a record of 17-21 with a goals against average of 3.74 and a save percentage of .871.